Navitas explores clusters of edtech innovation around the world. Admittedly, this may be more interesting to investors in education technology and/or entrepreneurs operating in this space, but even educators themselves may find this a fascinating read. If nothing else it points to some of the way our lives as entrepreneurial educators might change in the future. I am referring to the work done by Navitas in mapping edtech initiatives around the world. In the process, they have also devised a system of categorisation which no doubt will change over time, but gives a good start to helping us think about innovation in education. Progression – Peer to Peer and Tutoring, Language and Literacy, and Testing and Credentialing. 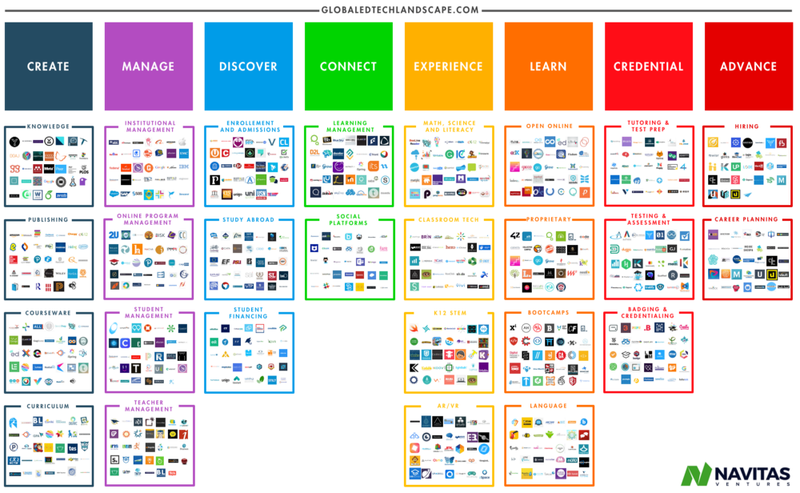 In summary, Landscape 3.0 maps 26 clusters of innovation across 15,000 companies in the next generation learning lifecycle and $50 billion of investment around the world. There are over 60 pages of market maps and profiles including analysis of each cluster on the dimensions of scale, investment, traction and disruptive potential. It offers analysis across eight stages of the next generation learning lifecycle, providing insights into market size and investment, innovation traction and disruptive potential . 0 responses on "Edtech around the world"